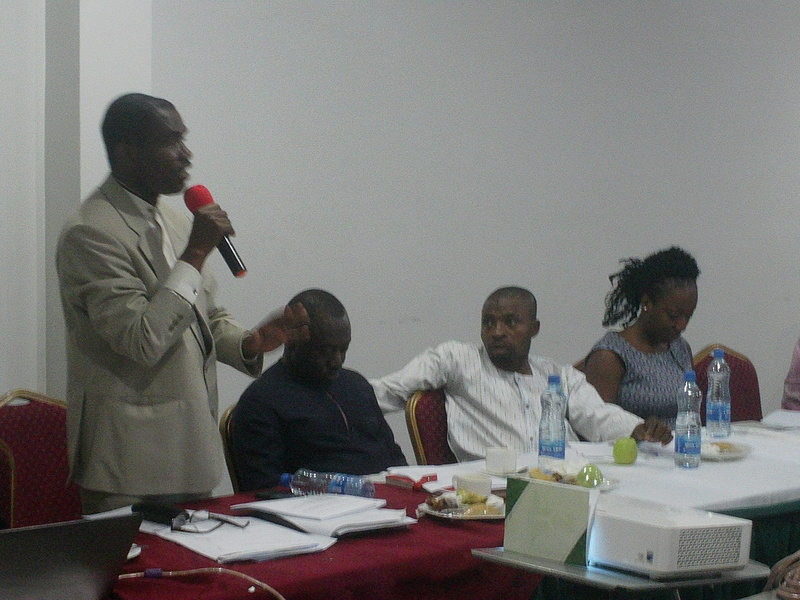 You are here: Home / Fuel Subsidy Corruption / FROM ADDIS TO ABUJA, ANEEJ SEEKS ASSET RECOVERY FRAME WORK. 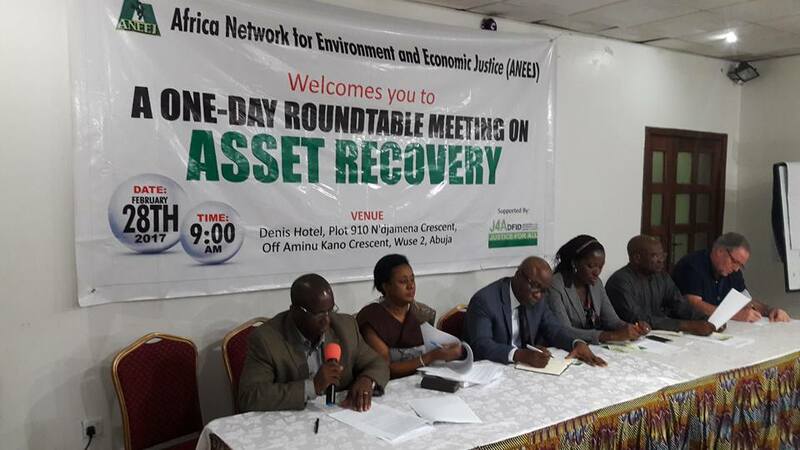 FROM ADDIS TO ABUJA, ANEEJ SEEKS ASSET RECOVERY FRAME WORK. BACKGROUND: The purpose of the roundtable was to bring stakeholders together to chart a common road map in the asset recovery process. This was against a backdrop of an earlier meeting on asset recovery and management organized by the United Nations Office on Drugs and Crime, UNODC, held in Addis Ababa, Ethiopia, 14-16 February 2017 and for which ANEEJ formed part of the Federal Government delegation. 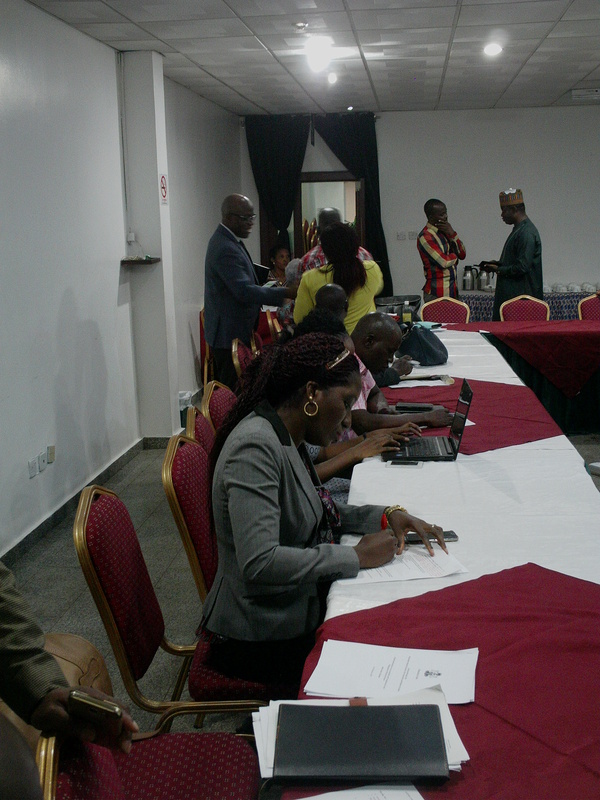 Over fifty participants from government, development partners, CSOs and the media attended the meeting under the chairmanship of ANEEJ executive director, the Rev David Ugolor. Opening remarks by the Rev David Ugolor. With him are representatives of government and partners. To discuss the recovery of stolen asset including fuel subsidy funds amounting to several billions of dollars – the journey so far and challenges in the prosecution of fuel subsidy corruption. To discuss the role of civil society organizations in monitoring the assets recovery process and the use of such recovered asset. To discuss current bills in support of asset recovery either before the National Assembly or those ones yet to be sent to the National Assembly as well as the 2nd UNCAC review process as it pertains to asset recovery. Thereafter there were goodwill messages from Bob Arnot of J4A, Waziri Adio of NEITI, the Presidential Advisory Committee Against Corruption, PACAC, the Code of Conduct Bureau, CCB, representative of the Minister of Justice and development partners which included the DFID, FOSTER, USAID, MAC-ARTHUR FOUNDATION and the UNDP. Bob of the J4A said that even though his organization has spent a lot of money to hire forensic experts to help with all the bills being presented at the National Assembly, there is no political will to push his efforts through and therefore the corruption cases have lingered on for too long. In spite of this, he said that he has been impressed with the ICPC, the EFCC, and the many CSOS who have worked extremely hard to keep the anti-corruption fight in the front burner of National Discourse. 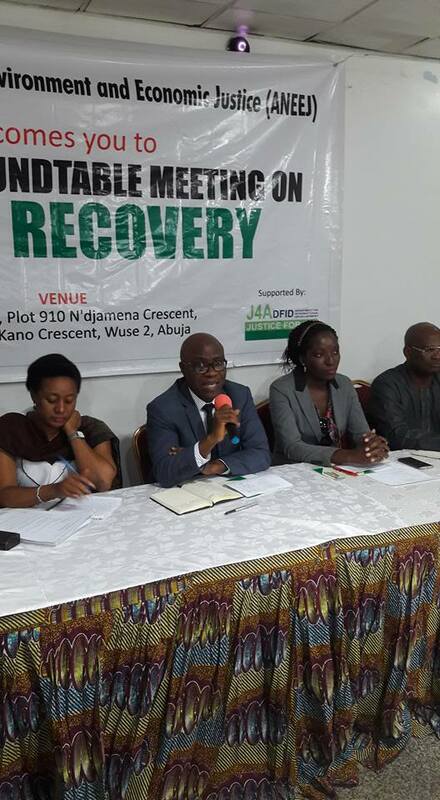 Executive secretary of NEITI Waziri Adio on his part said that asset recovery is important for the oil and gas sector because that is where a lot of the monies being stolen come from. Consequently, he called on all stakeholders to work together to ensure that mechanisms are put in place so that assets are not stolen, and put more interest in the recovery of stolen assets and help amplify the voice of government in that wise. Agom Tor of the CCB maintained that insisting that politicians should make their assets public has helped in reducing the unusual interest in public office. 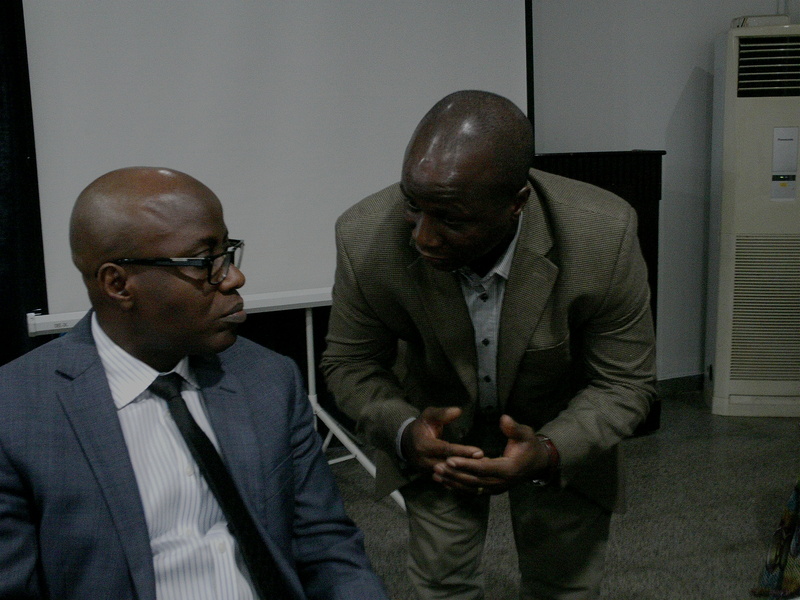 He said that even though the CCB does not know where domicile recovered assets are domiciled, it was important for the meeting to sort out ways and means of ‘solving problems related to asset recovery at the level of the consciousness of the defaulters. The PACAC representative, Dr Fatima Waziri-Azi told the meeting that looting of a nation’s assets increases a country’s debt burden. Dr. Waziri-Azi said that one of the greatest challenges that government experiences in asset recovery is the use of interlocutory and diversionary tactics. To that end, Dr Waziri-Azi said that the PACAC welcomed ANEEJ drive in bringing stakeholders together so as to try to establish a database of beneficial ownership, promote the Mutual Legal Assistance Bill and strengthen the fight against looting of public assets. Kehinde Oginni, representative of the Honourable Attorney General and Minister of Justice Abubakar Malami, declaring the roundtable open. Before declaring the meeting open, Isaac Kehinde Oginni who represented of the Attorney General and Minister of Justice, Abubakar Malami said that government is interested in the asset recovery struggle. According to Malami, nearly all the loot being recovered locally and internationally was being recovered as a direct result of the whistleblowing mechanism which the Federal government had put in place. Malami also said that government is exploring the voluntary disclosure programme earlier suggested by ANEEJ, but that this does not foreclose the prosecution of the individual doing the voluntary disclosure if voluntarily disclosed assets are in any way short of what is in actual fact looted. Discussions during the second session included the following: (i) recovery of stolen assets: the journey so far and challenges in the prosecution of fuel subsidy corruption, (ii) Challenges of Asset Recovery efforts and the interim Assets Forfeiture progress with prosecution of fuel subsidy corruption cases and (iii) Civil Society experience in the campaign and monitoring of loot recovery in Nigeria. In a paper titled ‘Remarks by the Honourable Attorney General of the Federation and Minister of Justice: At the Panel Session on Accountability and Transparency in the Management of Returned Assets, the Minister highlighted the following as definite targets by the Buhari Administration in the management of returned assets: management of a special account as stipulated by Section 162 of the Nigerian Constitution(as amended), application of single treasury, signatory to the OGP in July 2016, and the introduction of a Whistle-blower’s Policy in November 2016. He added that Nigeria has drafted a POCA Bill and has implemented the UNCAC requirement through the development of a National Strategy on Anti-Corruption. 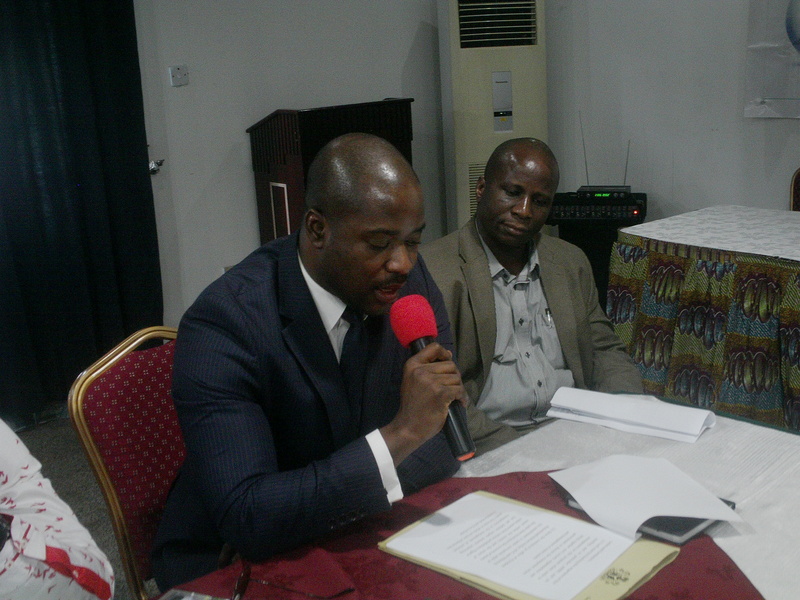 Godwin Iheabunike, assistant director in the legal drafting department of the Federal Ministry of Justice, made a presentation titled, ‘Some Current Bills in Support of Asset Recovery in Nigeria’. In the 55-page document (see attachment) Iheabunike said that a total of 7 bills were in various stages of being processed before passage into law. He said some of the bills basically provides for criminal forfeiture and a geared towards using assets-forfeited to yield more revenue instead of being left to rot. According to Iheabunike, because most of the 7 bills have not secured assent by the National Assembly, efforts are in the pipeline harmonize and prioritize them before sending them again to the National Assembly. 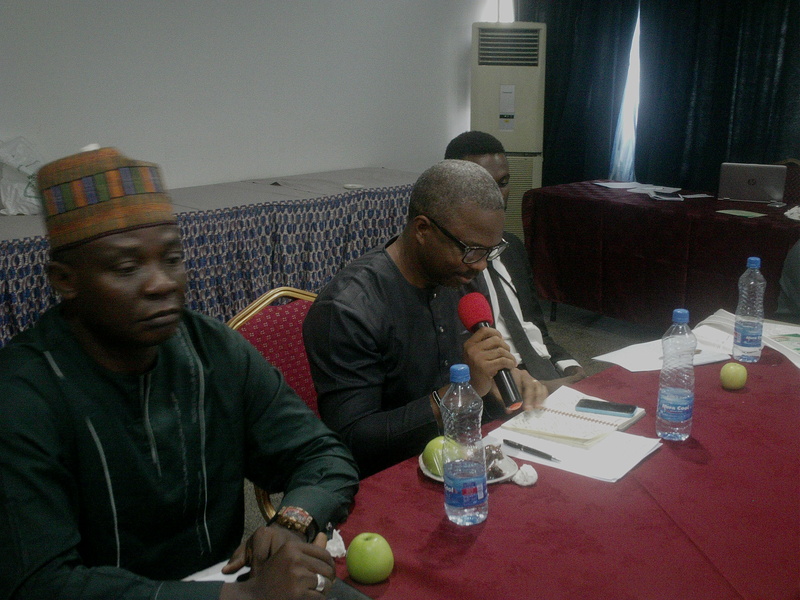 the Federal Government should use the Open Government Partnership(OGP) to strengthen cooperation with civil society and the international development community on asset recovery process. The presentations produced several remarks and suggestions which helped with the shaping of a communiqué. Joseph Amenaghawon of OSIWA said that the move by ANEEJ to register property in Abuja was a good one but proposals surrounding it must be streamlined in such a way that it does not produce a backlash. ‘It must be presented in a way that makes the common man the owner of the register’, he said. 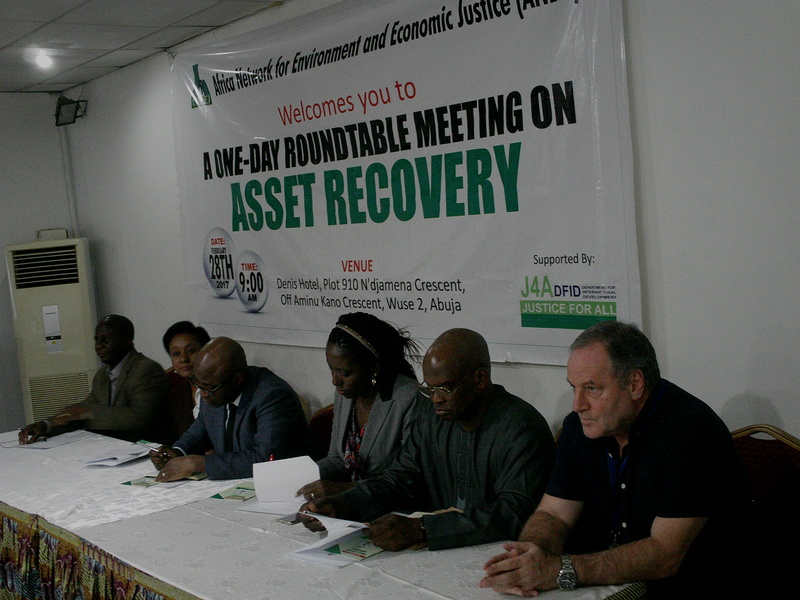 A Roundtable on Asset Recovery was organised by the Africa Network for Environment and Economic Justice (ANEEJ) at Denis Hotel, Abuja, on February 28, 2017. 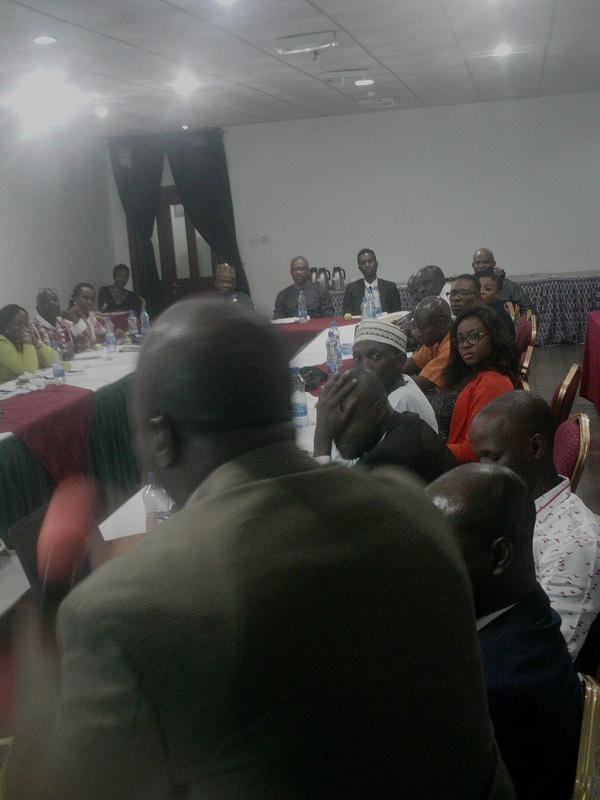 The Roundtable which was supported by Justice for All (J4A) was attended by Fifty (50) participants drawn from Federal Ministry of Justice, Economic and Financial Crimes Commission (EFCC), ICPC, Code of Conduct Bureau, the Presidential Advisory Committee Against Corruption, Development partners including our funding partners, CSOs including journalists among others. Sustainable Development Goal 16: Promote peaceful and inclusive societies for sustainable development, provide access to justice for all and build effective, accountable and inclusive institutions at all levels. Target 16.4: By 2030, significantly reduce illicit financial and arms flows, strengthen the recovery and return of stolen assets and combat all forms of organised crime. Need to make UNCAC an effective instrument to deter, detect, prevent and counter corruption and bribery, prosecute those involved in corrupt activities and recover and return stolen assets to their country of origin; as well as encourage the international community to develop good practices on asset return. Resolution 6/3 of the conference of the States parties to the United Nations Convention against corruption on “Fostering effective asset recovery” which encourages building knowledge on the management, use and disposal of frozen, seized, confiscated and recovered assets, and to identify good practices as necessary, building upon existing resources that address the administration of seized and confiscated assets, including with a view to contributing to sustainable development. Efforts of the federal government to fight corruption, particularly, the bold steps taken so far to recover looted assets, both locally and internationally. Actions taken by the Federal Government to strengthen assets recovery regime with new legislations in line with UNCAC provisions; to wit: a bill to establish a National Financial Intelligence Unit (NFIU), and a bill on the proceeds of crime among others. We should commend the FG new policy on Whistle blowing which we believe is already helping to strengthen anti-corruption war. 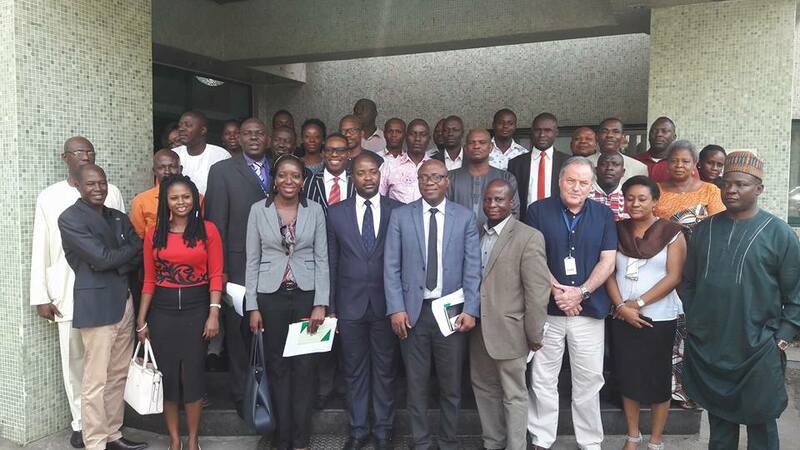 Federal Government for the inclusion of civil society in the Nigerian Government delegation to the recent International Expert Meeting on Assets Management and disposal of recovered looted assets held recently in Addis Ababa. That following investigations carried out by the Police and EFCC in the wake of the 2012 protests over oil subsidy removal and attendant massive corruption uncovered by probe panels/committees and investigative agencies of government, 50 persons/companies were charged to court and only one conviction secured till date. Weak cooperation of members of the international community in fast-tracking Nigeria’s asset recovery effort. Lack of existing policy frame work on the management and disposal of recovered looted assets that provides clear roles for Civil Society. We also call for a National Register on all recovered stolen assets including Non-Monetary assets. The National Assembly to expedite the passage of the Proceeds of Crime Bill and the National Financial Intelligence Unit into law which should make provisions for adoption of non-conviction based asset forfeiture approach in tackling grand corruption. Judiciary to speed up the trial of all oil subsidy corruption cases pending in various courts in Lagos and Abuja with a view to bringing all guilty to book as justice delayed is justice denied. In particular, more emphasis should be placed on assets recovery to ensure that crime must not pay. The International Community to strengthen their cooperation with Nigerian Government on corruption by repatriating all Nigeria’s stolen assets stashed in banks abroad to help Nigeria finance the Sustainable Development Goals (SDGs) as well as tackle insurgency and humanitarian crisis involving over 2.6million Nigerians living in desperate situations having been displaced by years of insurgency. We also call on the international community to focus more attention on assets recovery for victim countries instead of the current energy on management of same. Civil Society Organisations to hold both the Nigerian Government and the international community to account on their commitments to assets recovery in line with the provision of Chapter 5 of the United Nations Convention Against Corruption .